If you’re an emergency physician practicing in the UK you may be a bit surprised to hear about a trial published this week looking at the use of open reduction and internal fixation of rib fractures, and more specifically flail chests. Surgical management of rib fractures is something that took place 40-60 years ago, but in the modern world it’s arguably not routine. So many thanks to @traumagasdoc for asking the question after it came up at a trauma meeting in London. 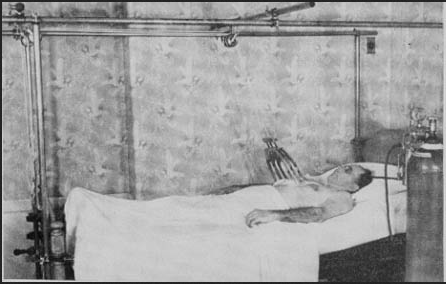 A quick look around the internet reveals some rather alarming photos from trauma.org of external fixation devices of the past. These external fixation devices remind me of some medieval torture devices and I guess it’s no surprise that they fell from favour. 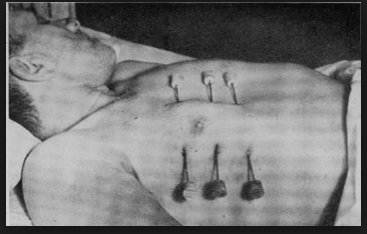 On the other hand we know that there is a significant morbidity associated with flail chest in trauma. In addition to the underlying lung contusion the pain and potential mechanical instability of a large flail segment can lead to pneumonia, pain and a prolonged hospital stay. Pain, a known complication and a prolonged hospital stay would serve as just reasons to perform an open fixation for many orthopaedic injuries – so why not the ribs? Following a short debate on Twitter it seems that surgical management has not dissapeared everywhere with colleagues in Australia and Yorkshire talking about it’s use in 2013. Perhaps our headline is a little disingenuous, in some places it has already returned (if it ever went away). J Crit Care. 2013 Surgical rib fixation for flail chest deformity improves liberation from mechanical ventilation. So perhaps it is time to reconsider the possibility of surgical fixation for patients with blunt trauma. [DDET Tell me about the patients] Good question, especially as this is not a randomised controlled trial. As we are looking at an intervention (surgical fixation) then an RCT would appear to be the right design. However, in this study they have compared historical patients with patients after deciding to use surgical fixation. Clearly this is not ideal as ‘other’ things may have happened over time that may affect the outcomes in this study. It’s a real problem when we appraise historical control studies – basically what else might have gone on to confound the results?? Patients were considered for surgical rescue therapy (SRF) if standard analgesia and physio support failed and patients ended up heading for ventilatory support. This is a reasonable group in my opinion, SRF is clearly invasive and has risks so focusing it as a therapy on those failing standard management seems wise. We also need to consider the exclusions in this study as they are a little odd. Patients with a low GCS and those that died in hospital. The reasons for this are unclear, especially in hospital mortality as death is a jolly important outcome for patients and in severe injury studies I feel that it has an important place when looking at outcomes. They do state that they excluded death reporting as there were no deaths in the SRF group – but I’m not sure this is wise. Lastly, the numbers here are very small. 11 controls and 10 intervention patients. [DDET What do the results tell us?] The authors state that the 2 groups were similar in age, injury severity score, intensive care unit LOS, hospital LOS, total number of rib fractures, and total segmental rib fractures. However, the numbers are so small we would not expect to see a significant statistical difference unless the groups were very different indeed. For example, the average ISS score was 10 points higher in the non-surgical group, this difference was too small to be statistically significant, but it might be clinically significant. The operative group demonstrated a significant reduction in total ventilator days as compared with the nonsurgical group (4.5 [0-30] vs 16.0 [4-40]; P = .040) with patients with SRF coming off the ventilator with a median of 1.5 days (0-8 days). In fact all the outcomes they looked at were better following surgical fixation. Patients appeared to do better but as the numbers are so small no statistical difference was demonstrated. [DDET How confident can we be about the findings?] This is a key question. I got quite excited about this paper as it is current, interesting and potentially addressing a serious problem in our trauma patients. However, this is a paper with many biases, and of most concern I would mention the following. The before/after design will always be exposed to the potential that we are seeing the effects of time rather than intervention. The small numbers mean that we may be seeing a type 1 error. In the control group patients were not selected for therapy. In the intervention group some patients were declined for surgical fixation. This is not then a comparable group. Although the differences in groups are not statistically different, they look as if they may well be and I would want to know a lot more about the patient characteristics and their injury patterns. [DDET So what does this really tell us?] Well, let’s not throw the baby out with the bath water. There are good pathophysiological reasons why this ‘should’ work and this early study suggests that there ‘might’ be a benefit. There are also papers out there that suggest an economic benefit to surgical treatment. In addition, a recent meta-analysis of papers comparing surgical and non-surgical fixation suggests a benefit for patients in terms of ICU LOS and complications of the injury. However, there were only 2 RCTs in this analysis amongst 11 papers analysed. As my good friend Bernard Foex tells me, this is a hypothesis generating study. I’d love to see more & even better I’d love to see an RCT, but that may not happen. The authors give a fair and balanced discussion of their findings with links to other case series in the literature. It’s reasonably well balanced and they mention many of the concerns raised in this review. I would agree that we would benefit from seeing data from a larger series of patients, and ideally from a well constructed clinical trial. If nothing else I’m pleased to see the debate come again and for our surgical colleagues to keep thinking and researching techniques that may benefit our patients. Surgical rib fixation for flail chest deformity improves liberation from mechanical ventilation. J Crit Care. 2013 Sep 24. pii: S0883-9441(13)00288-8. doi: 10.1016/j.jcrc.2013.08.003. [Epub ahead of print] Doben AR, Eriksson EA, Denlinger CE, Leon SM, Couillard DJ, Fakhry SM, Minshall CT.
Surgical fixation vs nonoperative management of flail chest: a meta-analysis. J Am Coll Surg. 2013 Feb;216(2):302-11.e1. doi: 10.1016/j.jamcollsurg.2012.10.010. Epub 2012 Dec 5. . Slobogean GP, MacPherson CA, Sun T, Pelletier ME, Hameed SM. Rib fracture fixation for flail chest: what is the benefit? J Am Coll Surg. 2012 Aug;215(2):201-5. doi: 10.1016/j.jamcollsurg.2012.02.023. Epub 2012 May 4.Bhatnagar A, Mayberry J, Nirula R.
It’s an interesting issue – the economic benefits are probably greatest in the young, who will get out of ICU quickly, saving considerable resources. For survival benefits it would make sense to trial it in the elderly, whose mortality after a flail chest injury is considerable. I agree this is a pre-trial and not grounds for mass-adoption of rib fixation, but a reason to do a decent, properly controlled trial. Couldn’t see the reference list from the meta-analysis, but this was published later in 2013 (but before your paper), so it may not have been included. A fairly well done RCT for rib fixation in flail injuries, at an Australian major trauma center, showing significantly reduced ICU stays (and therefore significant cost savings), as well as less assisted ventilation requirements. One could argue that this benefits the institution more than the patient, but less days in ICU has to be better for you. This institution performs this procedure routinely now, so there is evidence leading to practice change. Rib fixation for traumatic flail chests is performed at The Alfred. An n=46 RCT was recently published, with promising results (I don’t think this study was included in the meta-analysis you mentioned, as they were published about the same time). All studies have small numbers which reflects the frequency of the injury. It looks as though a ‘body of evidence’ is forming, but small numbers and selective case series can be biased. It looks to me as though there would be enough numbers for a clinical trial if multicentre. Dr Helgi asks questions about patient selection again which would be helpful if this is to go mainstream.